easy and quick to prepare indian style mushroom stir fry recipe. 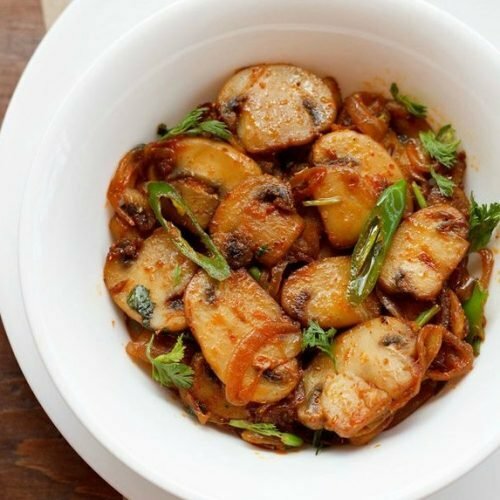 mushroom fry recipe with step by step photos – easy and a quick method to prepare an indian style delicious mushroom stir fry recipe. i get a lot of requests to post recipes which are quick to make and do not take long hours of cooking. 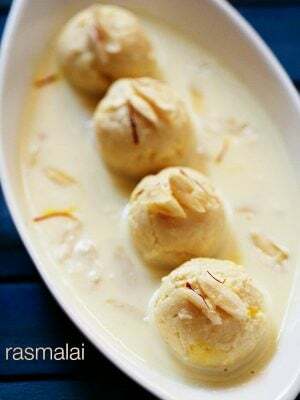 i will be adding such recipes that can be made quickly, but without compromising on the health factor and using fresh ingredients. 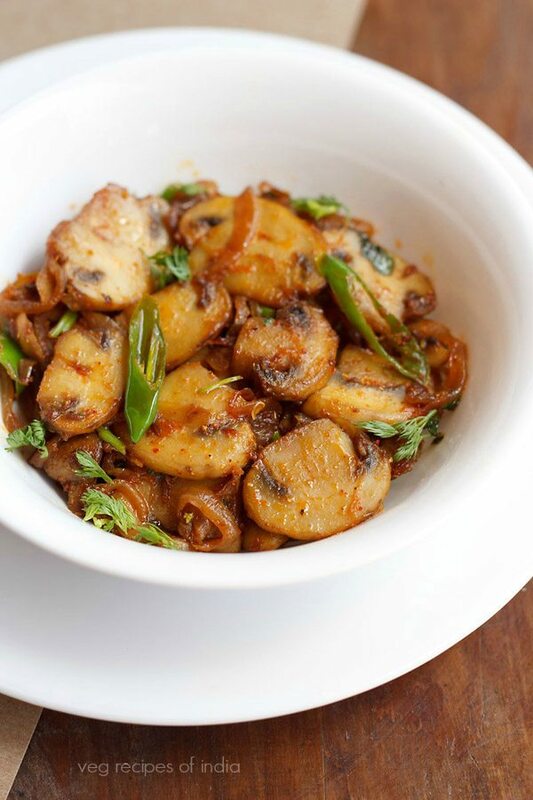 this recipe of mushroom fry is one i make at times along with the mushroom chilli fry and garlic mushroom. these three recipes are my savior recipes on days when i do not have the luxury of time to cook an elaborate meal. usually i have atta dough in the fridge, so after the mushrooms are cooked, i make phulkas and prepare a quick veggie salad. there are various ways and methods through which a stir fry recipe can be made. there are many variations possible. there are different recipes for stir fries like chinese, thai, malaysian and so on. i have also posted mushroom pepper fry recipe which is a spicy recipe of mushrooms with black pepper. 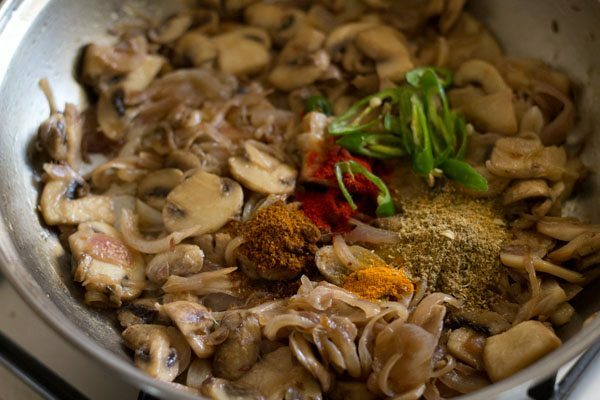 this particular mushroom stir fry recipe is indian style and uses basic ingredients that are easily available in an indian kitchen. everything is cooked in one pan. all the prep work, you need to do is slice the onions, green chilies and chop the mushrooms. the rest of the cooking is just stir frying or sauteing the ingredients in a pan. 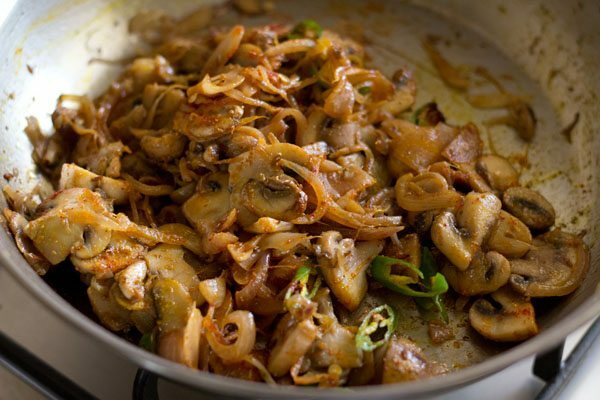 serve mushroom fry with chapatis, parathas or bread. 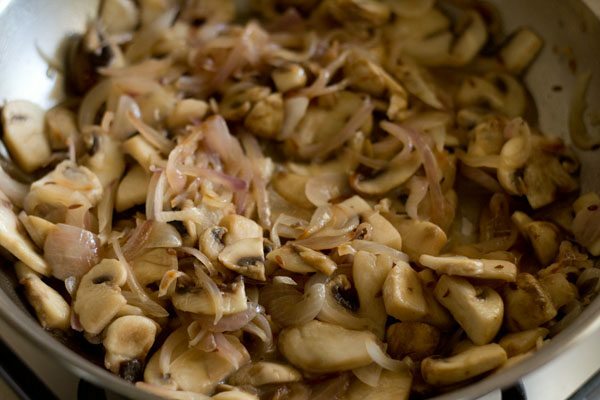 you can also make sandwiches or wraps with this mushroom stuffing. slice 2 medium sized onions. 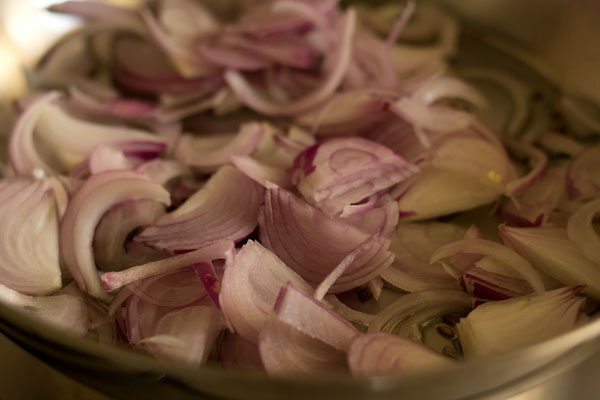 you will need 130 to 135 grams thinly sliced onions. also chop or sliced white button mushrooms. 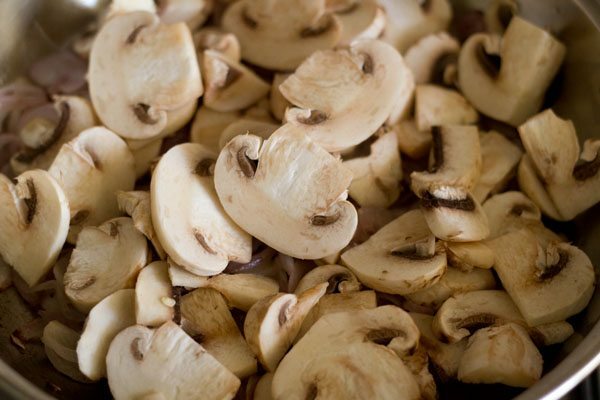 you can wipe the mushrooms with a clean kitchen towel and then chop or you can rinse them in water and then chop. i take each mushroom and rinse it well to remove the mud particles. then slice the stalk a bit and chop the mushrooms. i also slice bruised part if any in the mushrooms. heat 1.5 to 2 tbsp oil in a pan. then add 1/2 tsp cumin seeds. you can also crush the cumin seeds lightly in a mortar-pestle and then add. on a low to medium flame saute the onions till they turn translucent or light brown. then add the chopped or sliced white button mushrooms. 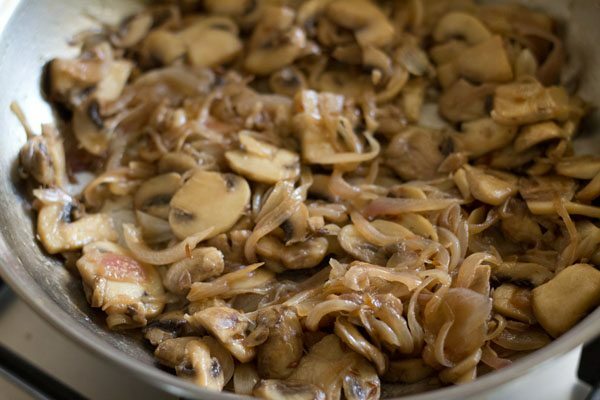 mix the mushrooms with the onions and begin to saute or stir fry on a medium to high flame. keep on stirring the mushrooms at intervals. the mushrooms will release water first. continue to cook, till all the water dries up and the mushrooms look glossy as well as they are slightly browned from the edges. even if they are not browned, the water should dry up in the pan and the mushrooms should be cooked well. 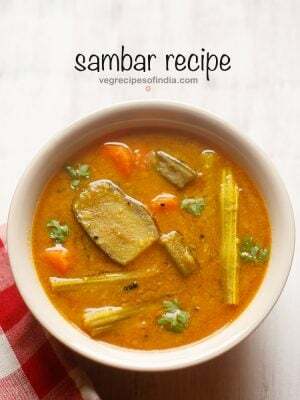 now add the following ingredients - 1/8 tsp turmeric powder or about 2 pinches, 1/2 tsp kashmiri red chili powder, 1/2 tsp garam masala powder, 1 tsp coriander powder & 1 green chili, sliced or chopped. mix the spices very well with the mushrooms. season with salt as per taste. mix the salt with the stir fried mushrooms. saute for a minute then switch off the flame. lastly add 2 tbsp coriander leaves and mix again very well. 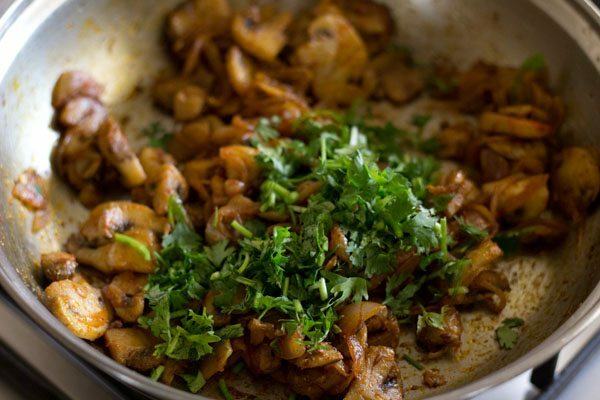 serve indian style mushroom fry with chapatis, parathas or bread. this mushroom fry recipe can be easily doubled. 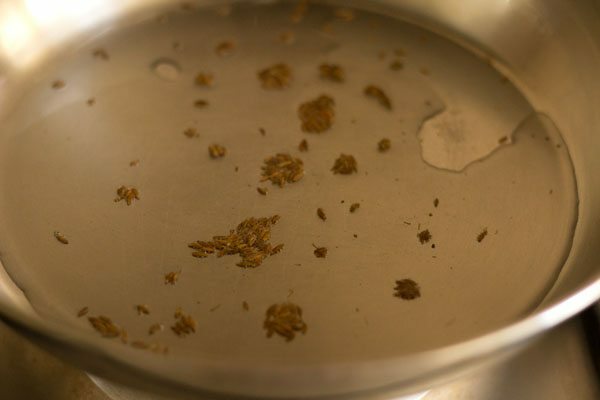 1. heat 1.5 to 2 tbsp oil in a pan. then add ½ tsp cumin seeds. you can also crush the cumin seeds lightly in a mortar-pestle and then add. 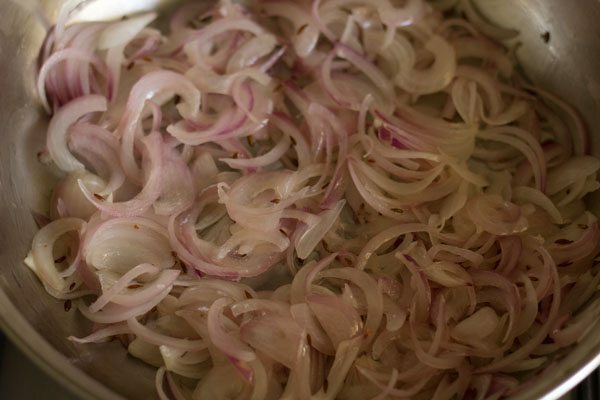 3. stir and begin to saute the onions on a low to medium flame. 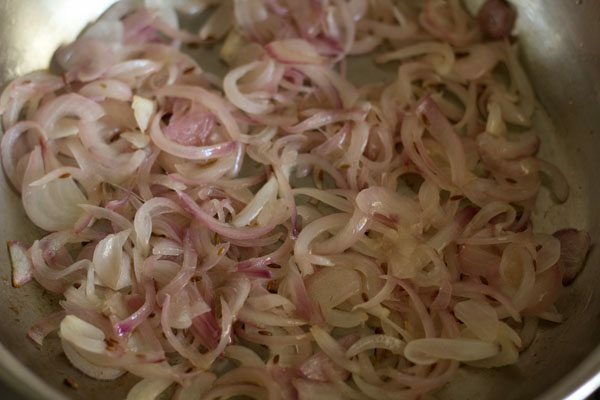 4. saute the onions till they turn translucent or light brown. 5. then add the chopped or sliced white button mushrooms. you can wipe the mushrooms with a clean kitchen towel and then chop or you can rinse them and then chop. i take each mushroom and rinse it well to remove the mud particles. then slice the stalk a bit and chop the mushrooms. i also slice bruised part if any in the mushrooms. 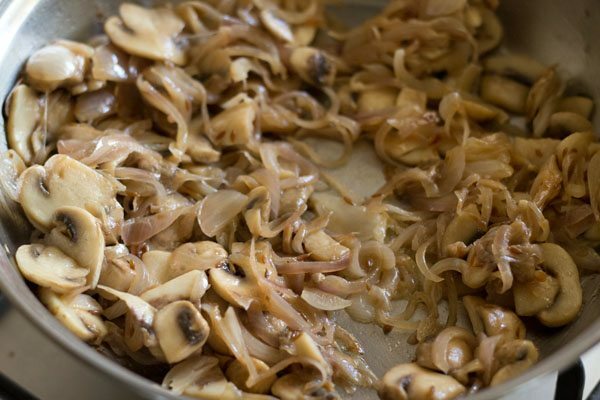 6. mix the mushrooms with the onions. begin to saute or stir fry on a medium to high flame. 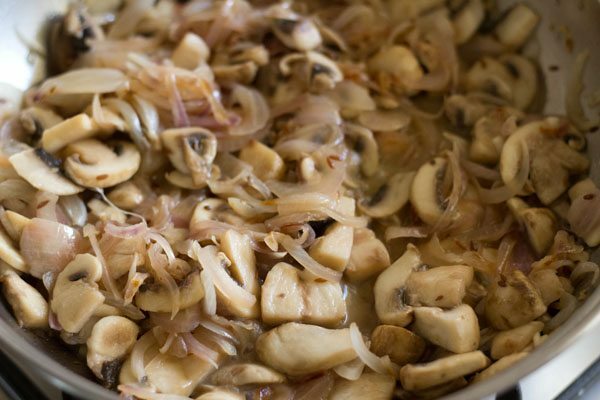 7. keep on stirring the mushrooms at intervals. the mushrooms will release water first. 8. continue to cook, till all the water dries up. 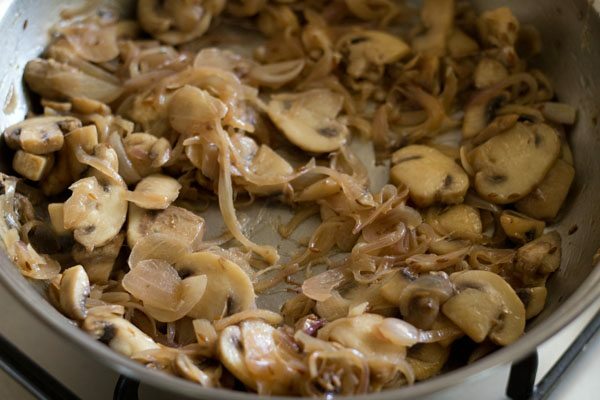 9. after the water has dried, continue to saute till the mushrooms look glossy as well as they are slightly browned from the edges. 10. even if they are not lightly browned, they should be cooked well. 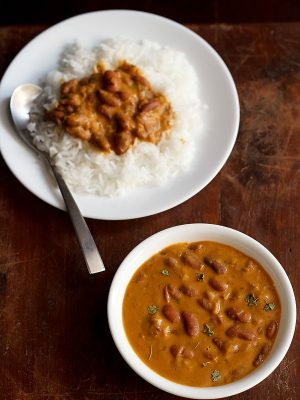 11. now add the following ingredients – ⅛ tsp turmeric powder or about 2 to 3 pinches, ½ tsp kashmiri red chili powder, ½ tsp garam masala powder, 1 tsp coriander powder & 1 green chili (sliced or chopped). 12. mix the spices very well with the mushrooms. 13. season with salt as per taste. 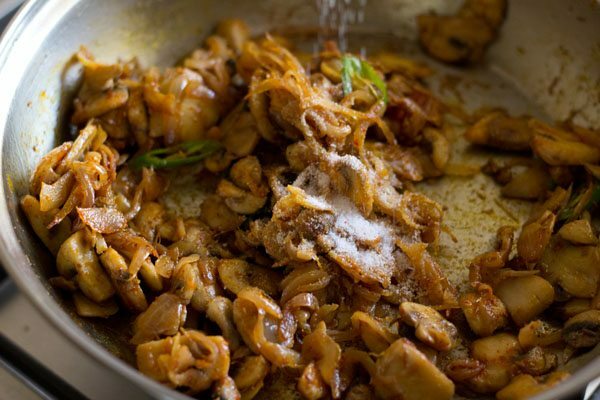 14. mix the salt with the stir fried mushrooms. saute for a minute then switch off the flame. lastly add 2 tbsp coriander leaves and mix again very well. 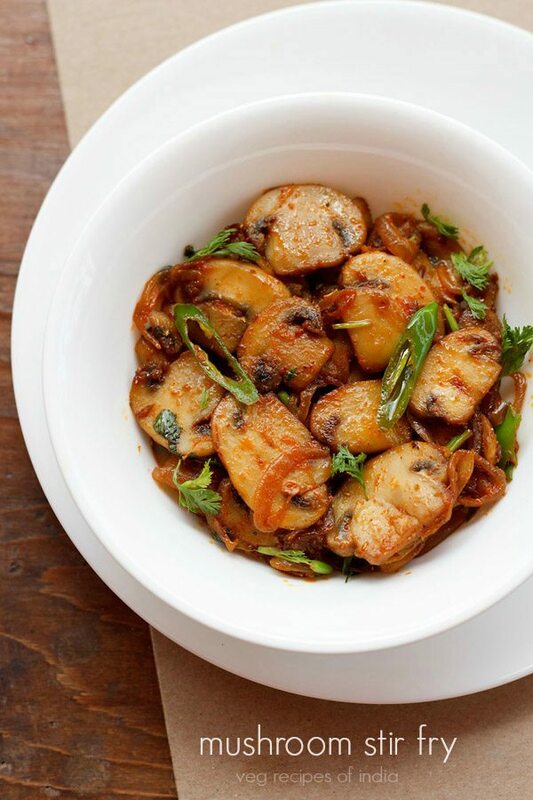 15. serve indian style mushroom fry with chapatis, paratha or bread. thanks indhu and glad to know that you liked this indian style mushroom fry recipe. Thanks NK. In the recipe card there is print button below the photo. nice to know gurmeet and thanks for the feedback. pleased to know this ashira 🙂 thankyou for your positive feedback also glad to know you like our app. Please tell me how we clean/ wash the mushrooms before cooking? immerse the mushroom in water for 10 mins then wash individually each mushroom under running tap. Then wipe with a cloth hope this process helps you in washing mushroom. 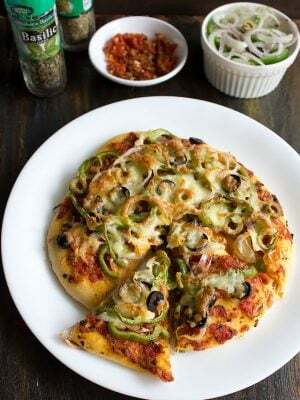 This recipe i tried and its yummy!! Thanks for posting the lovely recipes!! 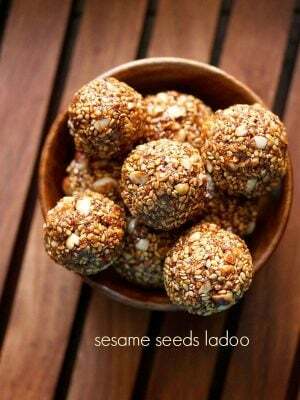 I have 1.5 years old son, could you please post few recipes of Ragi? 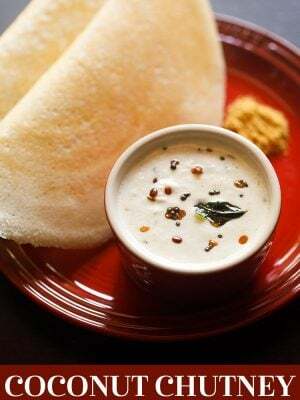 and also what all millets can we eat in summers? thanks neha. 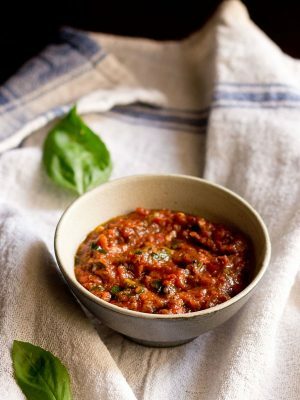 will try to add some more ragi recipes. i know only of jowar/sorghum being good during summers. i have never tried other millets in summers. Hey! I love your recipes. I had a question regarding this one. 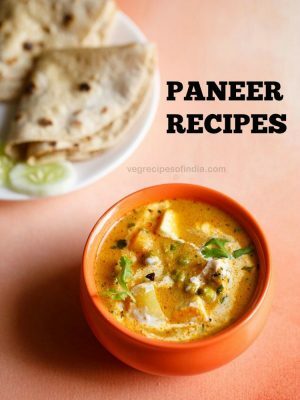 Can I substitute mushroom with paneer? TIA! Keep up the good work! yes akshatha you could 🙂 and thankyou.